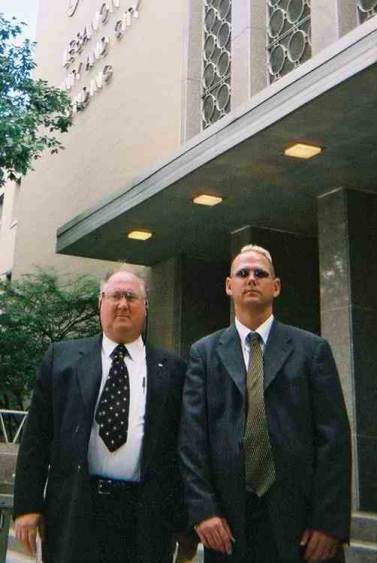 Ray Bradbury (the man who closed Straight, Inc.) on the right with theStraights dot com editor Wesley Fager outside the courthouse in Lebanon, Pennsylvania on September 11, 2002. Dateline Lebanon, Pennsylvania, 9/11/2002. Ray Bradbury (the man who closed down Straight) and Wes Fager (author of A Clockwork Straight) were in Lebanon, Pennsylvania the week of September 9, 2002 with the hopeful intent of testifying in the appeals hearing for Bradley Martin. Bradley Martin (who was in Straight - Springfield from 1988 to 1990 never making it above 3rd phase) is on death row in Pennsylvania for the murder of a Pennsylvania man. Bradbury and Fager were familiar with hearsay rules and knew that though they had no first-hand knowledge of the Bradley Martin affair, they were still hopeful that, being a capital murder case, the court would relax the hearsay rule and allow certain information that might contribute to the possible understanding of the psychological profile of and to the character building process of former Straight clients. To this end Mr. Bradbury and Mr. Fager were prepared to tell the court of Mr. Martin's horrific experiences in Straight based on their expert knowledge that clients in Straight are routinely abused psychologically and/or physically, and are expected to inflict abuse on others as a condition of advancement in the program. They were prepared to tell the court of numerous suicide attempts and body carvings of Straight students at Straights all over the country and at Straight - Springfield specifically, including an attempted murder by strangulation of a Straight oldcomer guard by a newcomer trying to escape. They were prepared to give the court the names of the ten individuals who have committed suicide subsequent to their Straight - Springfield experience, but while in Lebanon they learned from a fellow witness of the suicide of an eleventh former student from Straight - Springfield. They wanted to tell the court that in the last 20 years in Fairfax County, Virginia (where Straight - Springfield was located) there have been three occurrences of suicide pacts by teenagers, and that two of the three multiple-death suicides involved former students from Straight - Springfield. (Amnesty International has been tracking a juvenile drug rehabilitation program in Canada ever since two American teenagers from New York state escaped from that program in the mid 1990s and committed suicide in a pact.) They wanted to present documents to the court from Virginia state health records showing that kids who attempted suicide in Straight - Springfield were confronted and mocked for attempting suicide. They wanted to tell the court that Straight was notorious for getting kids to tell of their sexual experiences and then having that information discussed openly in a group of 200 kids, kids who often mocked the confessors. They wanted to testify that Straight kids are expected to give out psychological harassment and physical abuse in order to progress in the program. They wanted to tell the court that Straight often-time leads parents into thinking their child will be cured in a few months but that realistically, hardly no one gets out in less than a year and that frequently, for those few who remain, their Straight experience can easily stretch out to nearly two years. But in Bradley Martin's case, to have never made it past 3rd phase after 25 months, indicated, to Bradbury and Fager, that even by Straight standards, there might be some sort of special problem in Martin's case. -After getting out of Straight - Dallas, Timothy Nixon beat his mother to death with a baseball bat and drove around town with her body in the trunk of her car. -According to statistics from the National Center for Health Statistics, in 1987 the Tampa Bay area (Hillsborough, Pasco, and Pinellas Counties) had the highest suicide rate in the country. (35) It's not just because of the large number of retirees there either. The juvenile suicide rate in Pinellas County rose 130% between 1980 and 1986. (36) A 1992 study found that 1 out of 4 girls in neighboring Pasco County attempted suicide in 1991 (national average was 10%). (37) And in neighboring Hillsborough County the juvenile suicide rate rose from 3 in 1980 to 9 by 1987. (38) 19 youths committed suicide in Pinellas/ Hillsborough Counties in 1989 [up to nine of these were gay. ](39) Straight operated its founding center, Straight-St Pete, in Saint Petersburg, Florida in Pinellas County from 1976 to 1993. -In 1988 the National Center for Disease Control launched a study on juvenile suicides in Cobb County, Georgia because its suicide rate of 14.7 for every 100,000 was 3 higher than the state average, and 2 times higher than the national average. Straight-Atlanta, operated in Marietta, Georgia in Cobb County. -Dr. Richard Schwartz, medical research director for Straight-Springfield, noted in an article for Straight's newsletter EPIDEMIC , Vol 6, that suicide was the fifth ranked cause of death of American teenagers in 1964, third in 1978 and second in 1983. But Straight had started operating in late 1976 and had centers in Cincinnati, Springfield, Virginia, Saint Petersburg and Sarasota by 1983. Unfortunately, the commonwealth attorney argued that Mr. Bradbury and Mr. Fager did not personally know Bradley Martin and thus had no first-hand knowledge of specific abuse he may have sustained at Straight - Springfield. Their testimony, he argued, would be hearsay. The judge agreed and refused to let them testify. Mr. Martin had suffered as a child from other abuse besides Straight. Fortunately the court did allow in the testimony of mental health specialists who had treated him both before and after Straight. Perhaps their testimony can influence the court to commute Bradley's sentence to life in prison, or at least be the grounds for a re-sentencing hearing. If Mr. Martin can get a re-sentencing hearing, the court should be more receptive towards hearing the data that Mr. Bradbury and Mr. Fager possess. In such an event the two are prepared to travel back to Pennsylvania at a later date. There will be other steps in the appeals process which could extend another two years. Mr. Martin's appeal is being handled by attorney Christopher K. Walters of Reed Smith LLP, Philadelphia, Pa. If you were in Straight - Springfield from May 1988 to June 1990, and especially if you remember Bradley Martin during that time period, please email us at editor@thestraights.net .